It’s 4.30pm. The sky is darkening and it’s beginning to feel chilly. I’ve just put my summer clothes away until next year, and I decided too try and find a recipe for something I’ve wanted to cook for ages. 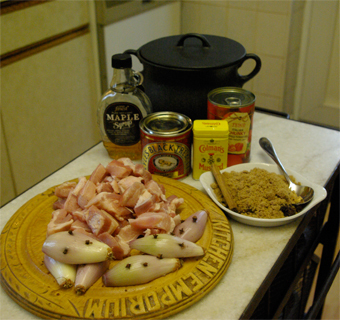 A Boston Baked Beans recipe. And Hurray! After searching through my many cookbooks, and then navigating the internet, I think I’ve found one that seems to have the perfect ingredients, such as black treacle, cannelloni beans, smoked bacon and brown sugar etc. Hope it’s chilly tomorrow then I can cook it for our evening meal. 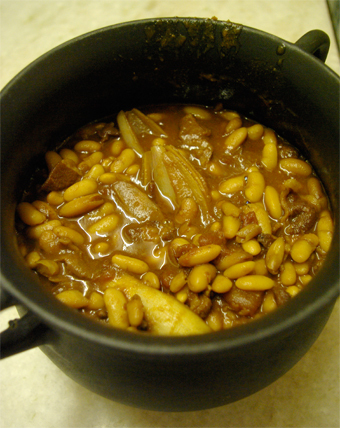 This Boston Baked Beans Recipe sounds great. It is a mixture of many chef's recipes, including Hugh Fearnley-Whittingstall's. You may want to add a bit of crushed garlic, or some chopped fresh chilli if you like your food hot. Thinking out loud, you could jazz it up a bit with chunks of garlicky Toulouse Sausages - sort of Boston Baked Beans meets Southern France. 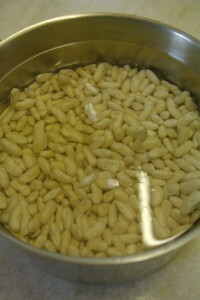 500g dried white haricot or cannelloni beans, soaked in plenty of cold water overnight. 400g piece of salt or belly pork, chunk of pancetta or smoked bacon. Lots of crusty bread to mop up the juices. Parsley to sprinkle on top. Put the dried beans in a very big pan or bowl (they will double in size), and cover with lots of cold water. Leave to soak overnight. Next morning, drain the beans and rinse them well. Put the rinsed beans in a big, heavy casserole dish (one big enough to house all the ingredients for the dish). Cover the beans with fresh water with about 2 inches (5cm) above the beans. Bring to the boil and allow to boil well for 10 mins, skimming off any scum that comes to the top. Reduce to a gentle simmer and cook for about an hour. Be careful the water doesn't dry up, and add a bit more if needed. Meanwhile pre-heat the oven to 140C/120Fan /Gas1. Or you can use your hob if the casserole has a strong base. Cut the chunks of pork or pancetta or bacon into good bite-sized chunks. Leave the rind on to add taste. Add to the rehydrated beans in the casserole. Stick 2 cloves into each half of the shallots. Add to the beans. Stir in all the other ingredients except salt. (There may be enough salt with the meat). Go gentle with the cinnamon stick, so that it doesn't break up. The beans need to be just covered with water, so if necessary, add a tiny bit of hot water to cover. Make sure the lid of your casserole is a good fit - if not brilliant put a strong piece of foil across the top of casserole, bend it well over the edge and replace the lid. Bake in the oven (or use your hob if the casserole has a strong base) for three hours. Remove lid and pull the meat chunks, with rind showing, to the top of the dish to crisp up. Put in oven with the lid removed for another hour. This should thicken the sauce up. Check the seasoning and serve up with Crusty warm bread and parsley. Well, back to cooking and photographing our own food. This may look a lot of work, but it isn’t. I had a choice of using tinned beans, but I wanted to make the Boston Baked Beans recipe the ‘proper’ way, and soaking the beans overnight is not hard work at all. Just put them in the pan or big bowl, add water and leave while you sleep. What could be easier? You definitely need a strong-based pan, and my lovely cast-iron bellied bean pot was just perfect. I bought this about 20 years ago when I worked for AGA, and I think it will last for ever. I really love it, the pot-bellied shape which I almost want to stroke, and the sheer strength of it. 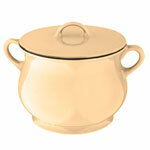 I noticed that the AGA Cookshop are selling them now in enamelled colours, which look fabulous. Even though I had to leave my great big AGA behind when I moved house, my AGA cookware is still going strong. 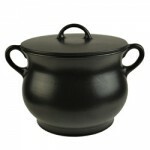 And my black pot-bellied pot will even be suitable for the barbecue and my wood-fired oven. So versatile or what? The other casseroles from the AGA Cookshop are well worth looking at, and are certainly built to last. 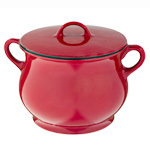 The round cast-iron and enamelled casseroles come in different sizes and colours, some quite substantial. 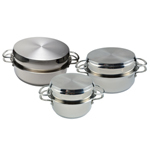 The AGA Stainless Steel Buffet Pans (in the middle picture) are versatile. The lid doubles as a frying skillet, and I use my lid to pre-fry either pieces of meat or a joint before using the main pan to cook a casserole or roast in. 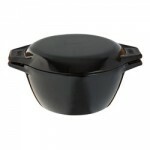 The main base pan has an impact bonded base which allows the heat to extend the full radius of the pot. 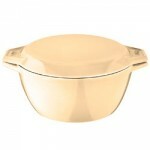 Perfect for use on all hobs, including induction and dishwasher proof. I do use mine a great deal. All of these casseroles and buffet pans would be perfect to make your Boston Baked Beans in, and would make a great present for cooks. Now back to both eating and cooking (thank heavens), I have resurrected my all-time love of cookshops, and looking at all the new bakeware and implements from the AGA Cookshop was a joy. Maybe more expensive than some shops, but their products are really built to last, so it’s worth having a look at all of them. Click Here to go straight through to the AGA Cookshop for a good browse. Meanwhile, I hope you’ve got your shopping list ready, and are going to have a go at making this Boston Baked Beans recipe. Thinking back on cooking the one for our meal, I maybe should have left it in the oven a bit longer, to reduce the liquid more, and the top crust should be darker and stickier. Note to me for next time to leave it in for another half hour at least. But I can vouch for the fact that it tasted absolutely gorgeous – rich and very yummy. And it freezes well. So check your pan or casserole for strength, and enjoy both cooking and eating your Boston Baked Beans.